Keyrings include a house shaped, van shaped, anything from a mobile phone to a football strip, even a working bottle opener. Prices includes one colour print both sides. So choose which design you like the best and we'll see that they all get printed up with your business details and company logo. Keep yourself promoted with Calebdar Lady Promotions. 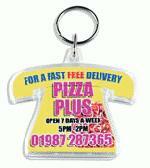 Advertise your business on our shaped keyrings. We have an extensive range of shaped keyrings that can be personalised with your business details, logo and telephone number.